As diesel sales slump and those of electric vehicles pass one million, batteries are fast becoming a major part of the EU’s industrial future. It is not just talk this time. Investment is happening: LG Chem is planning for production in Poland and Samsung SDI is doing likewise in Hungary; NorthVolt has just signed a large loan to build a demo plant in Sweden, and Saft, a subsidiary of Total, announced a battery consortium with Siemens, Solvay and MAN. Amidst all this, the environmental benefits of electric cars are under intense scrutiny with news articles on this a regular feature in most EU countries. So, do electric cars reduce car CO2 emissions or do they just shift the problem elsewhere? To understand the impact of electric vehicles it is important to look not only at their use – ie, when you drive them – but also at the energy used to produce the vehicle and the battery. For this we use lifecycle analysis. Lifecycle methodologies are based on complex modelling with a number of assumptions determining how battery cars perform vis-à-vis fossil fuel cars. The most critical factor is the carbon intensity of electricity used to power and build the vehicle. Another crucial factor is what is being compared. Good lifecycle analyses compare similar vehicles and use real-world emissions data for both battery electric vehicles and combustion cars. Equally important is the battery vehicle’s lifetime and mileage: the longer a vehicle is used, and the more kilometers driven with it, the less important the vehicle’s production emissions are. Finally, there’s the production of batteries, with the emissions impact depending on battery size, lifetime and chemistry. Again, the electricity’s carbon intensity is key: while most battery cells today come from Asia, the electricity in China (0.69 kgCO2/kWh 2013) is similar to that in Poland (0.65) while that in South Korea (0.54) is only slightly above the EU average (0.45). However, electricity is decarbonising rapidly in all cell manufacturing areas and in Europe the carbon intensity of electricity will more than half by 2030. In the future the embedded carbon in the battery will be significantly lower wherever the cells are produced; especially if manufacturing is located in a low-carbon intensity country such as Sweden (0.014). A recent report from the transport committee of the European Parliament illustrates how sensitive the lifecycle analysis is to the assumptions used. This study claims that gas and coal powered EVs are dirtier than diesel and petrol cars. But the carbon intensity figures used for both natural gas and coal electricity are global (0.67 kgCO2/kWh and 1.16 gCO2/kWh respectively), much higher than the relevant EU figures. Since cars bought in France do not often recharge in China or Zimbabwe, this assumption skews the lifecycle analysis considerably. At the same time the fuel use of both petrol and diesel cars is based on the obsolete NEDC test procedure, portraying a distorted picture as to their efficiency and in-use CO2 emissions which, in reality, are at least 40% higher. But it is not just the quality of the analysis and assumptions, but also how the results are presented that is important. A 2017 study by the Massachusetts Institute for Technology (MIT) was reported in the Financial Times and reproduced in numerous press articles across Europe. The FT article used the study to compare a small, highly efficient petrol car with a large Tesla S powered by the US’s dirtiest electricity. The unsurprising outcome was that the small petrol car looked good in comparison – which mostly confirms small cars are better than big cars. The way the study was used was subsequently criticised by its MIT authors in that same newspaper for comparing “apples-to-oranges” and ignoring their broad conclusion that, on average, electric vehicles emit significantly less CO2 than petrol cars. This was also the conclusion of a study T&E commissioned in 2017. This found that battery electric vehicles are 50-60% better than fossil fuel ones, consistent with the findings of the JRC study that does include upstream electricity emissions. It also tallies with a 2017 study for the European Climate Foundation and the latest overview by the ICCT that reviewed a dozen battery lifecycle analyses done since 2011. Opponents of electrification will continue to misuse lifecycle analyses to discredit battery electric vehicles. But they need to be increasingly ‘creative’ to do so. 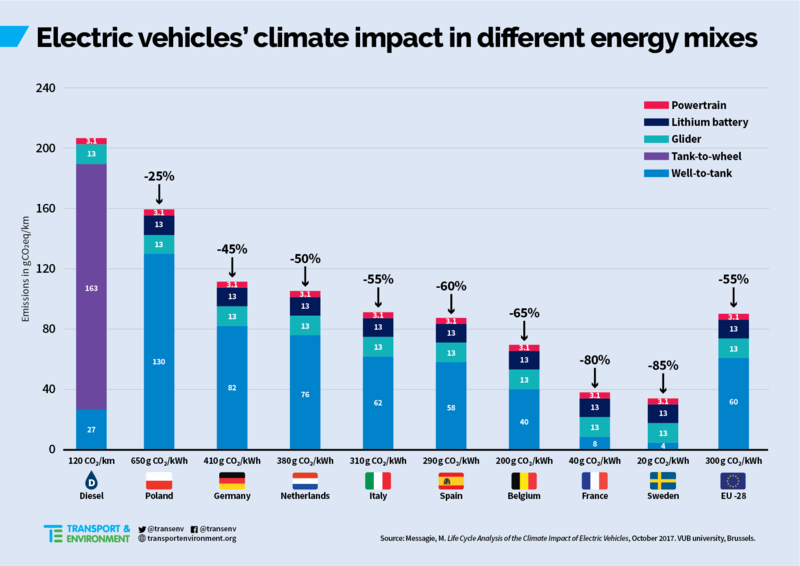 For example, the EU oil industry lobby, FuelsEurope, makes extensive use of a 2012 Trondheim study to argue EVs are more toxic than conventional vehicles. However, the industry omits to mention that the authors of the study issued a correction a year later. Most notably, the authors changed the assumed lifetime from 150,000km to a more realistic 180,000km. That alone increased the lifetime CO2 savings of the Nissan Leaf over a Mercedes A-class by almost 10%. Attempts to create uncertainty over the CO2 merits of electric cars are no more legitimate than attempts to discredit the science of climate change. 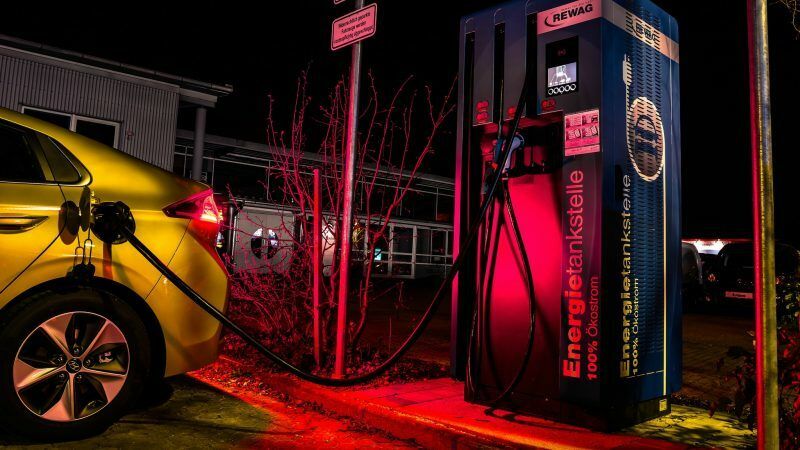 The reality is EVs win – they are already lower carbon but with electricity being decarbonised they will be significantly better in the near future. As electricity becomes cleaner both the embedded emissions in manufacturing and those in use fall. It’s worth remembering that the exact opposite is true for fossils and biofuels: the more we expand oil (arctic drilling, tar sands) or biofuels production (deforestation), the worse things get for the climate. Of course, that doesn’t mean there is no room for improvement. More needs to be done to ensure that battery production becomes socially and environmentally sustainable and remains so while e-mobility takes off. This is why T&E is part of the WEF Battery Alliance which leads global efforts on responsible supply chains of minerals such as cobalt, nickel and lithium. We have also actively participated in the EU Battery Alliance, pioneered by European Commission vice-president Maroš Šefčovič. One of the recommendations of the planned battery strategy is to put in place a comprehensive methodology and labelling for lifecycle analyses to distinguish between batteries. We welcome the Commission’s plans: there is enough solid evidence that electric cars are already better today. This will only improve going forward, thanks to faster integration of renewables into the grid and, if managed well, efficient reuse and recycling practices and a responsible supply of materials.